All songs and music by Mark Gomes. Mixed by David Ashton, Danny Jumpertz and Mark Gomes. Who or what is Barrage? Is he a hero or merely dirt? In both music and life, the songwriter cuts an ambiguous figure; that of a defiant, melancholy young man, brooding on some mysterious and unforgivable sin in his past. Whatever the sin is, he never tells, but neither does he deny the legends of wildness, evil and debauchery that have grown about his name. The heroes of his chansons – all thinly disguised versions of Barrage himself, of course – are generally brigands performing heroic feats of love and compassion. In life, however, the artist is short, badly sighted and projects a gloomy outcast. The dichotomy of his personage is that of stalking-horse and devil’s advocate. Barrage’s songs are biographical in function. You’ll notice that whatever the ventriloquism adopted, he always remains in the first person. It is this close presence of the artist behind the work – opining and attitudinising, carping and shrugging – which makes the duality vital. With Barrage, we have always to reckon with the man’s conceit of himself as raw material to be satanized. The songs are a biography and the biography is a loose conspectus of how it feels to be Barrage. His performance, one suspects, helps mitigate his self-concern and functions as a means of endowing himself with preternatural colour. He reminds us of those people who ‘hate scenes’ yet make them daily, who find hysteria and dynamic indignation conducive to their special brand of spiritual ease. Barrage says it was rage that first made me an artist, and from then on a need to be vivid and spectacular in my own eyes has kept me going. He will forego all inner peace for the sake of an unceasing external show. To try excluding the man is eventually to discover that little of the music can stand-alone and, if it is made to, seems like fragments from the hands of various pasticheurs. The main pleasure with him is the contact with a singular, though divided personality. It is not a silly pleasure either; the music returns to us with illumination and no little shock after we have heard our weaknesses, poses, aspirations and manias made-over by his schizophrenic temperament. “ Hero or Genius? . 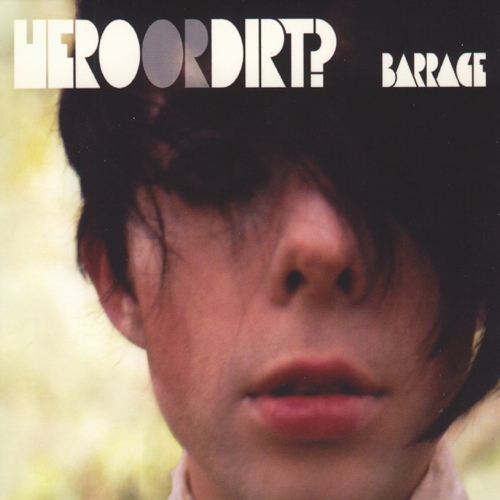 . . ‘Hero or Dirt?’ is one of finest electro pop records released in Australia ever. Barrage is Mark Gomes, a man drowning in his own melancholy. Second track ‘Fantasy Number’ encapsulates Barrage, lo-fi electro that swells with Morrisey-esque imagery. Mark Gomes (ex-Lovepack) has dropped a bewitching debut album — in a perfect world the sleeve would be bound in leather and lace with Gomes personally delivering each copy. This precious document is woven with care, decorated with buzzing tones and sustained pitches that gather, warm and raw, ‘round syncopated, shifting drum hops.